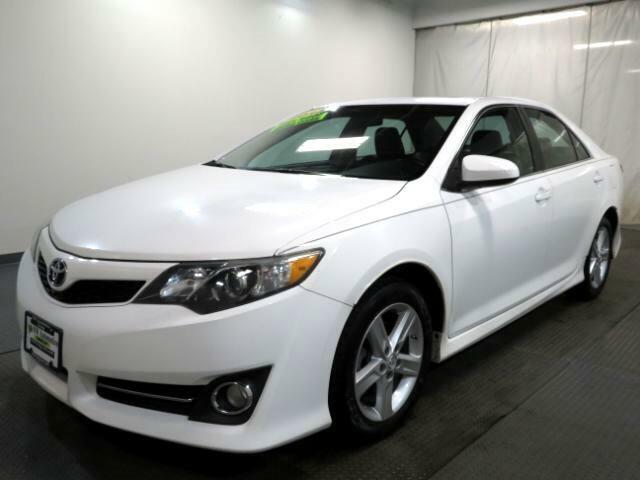 The 2013 Toyota Camry stands as a quietly competent midsize sedan. Though it''''''''s not particularly glamorous, the Camry checks off most of the boxes for most folks shopping this segment. Chief among this Toyota''''''''s desirable traits is its peppy yet economical performance with either the four-cylinder or V6 engine. (Those seeking maximum mpg should consider the Camry Hybrid, which is covered in a separate review.) The Camry also offers comfortable seating, solid build quality, a sterling reputation for reliability and low ownership costs. ***Internet special. Price reflects discount for cash buyers. Traditional and special financing is available for qualified buyers. Please contact us first for availability as our cars go fast at near wholesale prices. Prices are subject to change. Sales Tax, Title, License Fee, Registration Fee, Dealer Documentary Fee, Finance Charges, Emission Testing Fees and Compliance Fees are additional to the advertised price. All options and conditions of the vehicles must be verified with the dealer, any descriptions or options that are listed maybe incorrect due to automatic data transfer.